No. 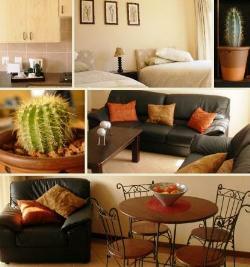 157 is a two bedroomed self-catering apartment located in the heart of Centurion. The apartment has a lock ip garage and is inside a secutiry complex. The self catering apartment is just off the Ben Schoeman Highway and central in Gauteng, being close to all amenities and a very convenient, safe destination for tourists, business people and families alike. The apartment has 4 single beds, comfortable lounge furniture, dining table & chairs, TV, a small balcony as well as cooking and ironing facilities you will find everything you require for an enjoyable stay at affordable rates. The kitchen is fully equipped with a small refrigerator, stove, microwave oven, toaster, kettle, crockery, cutlery and utensils. The bathroom consists of a bath, washbasin, shower and toilet. All linen and towels are supplied. You will be situated a few minutes from the Centurion Lake Mall, SuperSport Cricket Ground, Unitas Hospital, golf courses, cinemas and restaurants. Johannesburg International Airport, Sandton, Pretoria and Johannesburg CBD are all within a 35 minute drive.